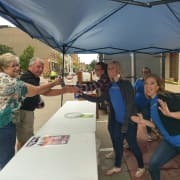 During this timeframe, volunteers will be assisting in setting up the beverage stands for the Dubuque... And All That Jazz event. Please meet under the Town Clock for instructions on how to set up the stands. Lifting of beverage cases, bending over to set up beverage tubs, lifting 20# bags of ice and putting up tents are part of the duties. We appreciate your help and will offer 2 beverage tickets and $5 in food tickets to utilize at any of our Jazz events in 2019.